The Boppy pillow is great for little babies, at rest and at play. Babies enjoy lying back and flaking out in the comfort and support of the Boppy as well as appreciate the security it provides when baby is learning to sit up. It is a soft spot for nursing as well, providing mama with much needed support and eliminating the tired back and arms of those marathon nursing sessions! 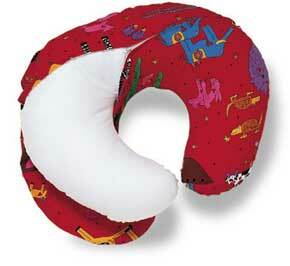 Named the "Best Nursing Pillow" by Child Magazine readers. Boppy was voted one of the top five products that a new mom can't live without! One of our Bravado nursing bras? Only $33.50 CAD+ 1FREE set of Bravado doublers! Now washing your Boppy has been made easier! Just a quick toss in the wash and the spit-up is gone. You no longer have to wait for your pillow to dry out, and you will want to use your Boppy so much that you won't want it to be out of comission for even a second! Now the Boppy is even better! Now baby can learn and play as well as nurse in the cozy comfort of his favourite pillow. The boppy now comes with a detachable playtime arch in bold contrasting colours to help stimulate baby's developing vision. 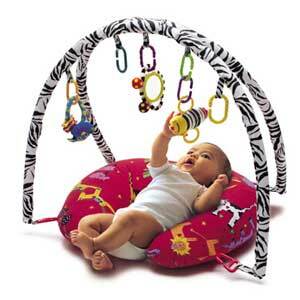 Sassy toys dangle from the arch enticing baby to swat and swipe and develop those motor skills. Detachable links allow you to add and remove toys to keep the play arch always new and interesting. I used the Boppy in the hospital, which after having had a c-section was really a necessity. I also used it when I got home to nurse him while I worked at the computer (as a matter of fact he is sound asleep on it on my lap now - 9 months later!). He loved the toy bar before he could sit up. He would play for long periods of time. When he was learning to sit up, I would plop him down in the Boppy and not have to worry about bumps and bruises. The Sassy toys that come with the 5-in-1 remain his absolute favourites! At a very young age, babies need to spend time on their tummies. Playing in this prone position is especially important since it's recommended babies sleep on their backs. The smaller sized Boppy® shape makes it easy for babies to push up on their arms. The attached mat protects babies belly from hard or rough surfaces. Attached toy loops provide babies hours of entertainment. Complete with award winning Sassy toys.